I see a lot of new products come through my inbox. There are a lot of people out there right now really pushing to try to create something new and interesting. Something that makes us rethink everything we thought we knew about a particular type of product or process. They don’t always work, but sometimes something comes along that challenges the norm. I’m not suggesting that the new Lumapod tripod sits in one particular camp or the other, though. I’d have to try one before I could make any kind of judgement. But it definitely looks a little strange. It packs up into what looks like a giant minimalist light sabre handle. But when you open it up, it’s a monopod with feet… and string. The selfie stick is an insanely popular gadget, yet the very thought of it makes many people cringe. It’s often a subject of mockery and bans, although some artists have used it in their work creatively. Well, if you hate the darn stick that shows in the photos, the latest gadget from the selfie stick inventor might be the solution. Selfie sticks are so 2014. And because of this, Ted Forbes has created the ultimate selfie stick for all the super-narcissistic souls out there. He named it Stork Mach 1, and it’s made for taking photos, video and live-streaming. In light or dark, in any climate, you can point that camera towards you and click. Now that’s a selfie stick! Of course, this whole concept is a result of a joke. He created this ultimate selfie-stick as a “sister” to his smaller rig Sparrow M1. 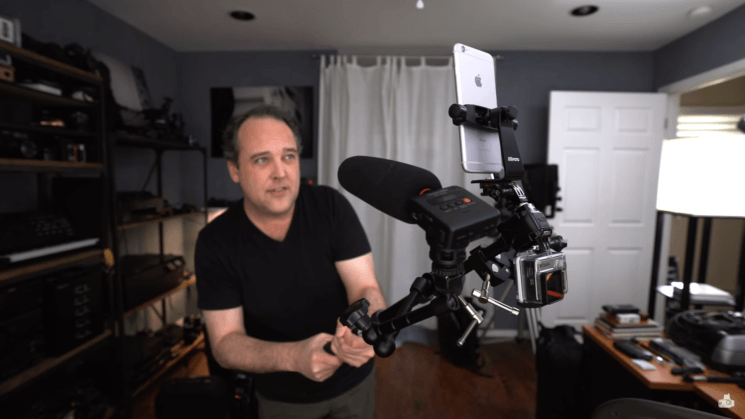 However, you can still get something useful out of this video and learn how to build a rig for mobile photography and videography. Selfie sticks have been around for a while, and (unfortunately) it seems they are here to stay. They serve as a tool to help you take a photo of yourself with (or without) your friends and get everyone in the frame. But, is it that easy to take a high-quality, artistic selfie with a selfie-stick? This “professional selfie-stick photographer” hit the streets of New York City and offered people to help them take professional photos with a selfie-stick. For many, it’s difficult to walk around town without bumping into one or two selfie sticks. Perhaps you’re even the one who’s out there with the selfie stick. Love them or hate them, they’re here to stay. We don’t have to like it, though. And that is expressed brilliantly in this little tune from Monty Python’s John Cleese and Eric Idle. Described by John Cleese as “One from the heart”, the song is possible not quite as subtle as some might expect. Titled “F**k Selfies”, there’s no mistaking their views by the end of the song. Now, the camera (and stick) sunk to the bottom of the lake and we never could find them. I later realized that I should have used a buoy rather than a selfie stick. A buoy makes the camera float when it is in the water. Now, a buoy is not expensive, it is only a few dollars on amazon, or $2 on ebay shipping included, as noted in the comments. Sadly, I was nowhere near a store where I could buy one. Even when you’re not likely to fall off a cliff, shooting selfies can be dangerous. Even in seemingly harmless conditions, selfies present risks that we should all be aware of. Did you know that the “duck face” pose draws blood away from your eyes and impairs your vision? This and more selfie defense tips come in this humorous short video from Master Ken with assistance from “Millennial” Cathleen. Just when you thought it was safe to go out without seeing selfie sticks all over the place, something like this comes along. Ok, well, not really. The “Selfie Stick unREAL” isn’t actually a real product. Thought up by marketing firm Thinkmodo to help promote the new season of Lifetime’s UnREAL, a show which parodies supposedly unscripted reality shows by taking us behind the scenes of a fictional reality show, this selfie stick won’t be making it to stores near you any time soon. Will a selfie stick blend? ‘Will it blend?’ These three simple words are known across the web thanks to Blendtec, a company famous for putting its blenders through brutal tests by grinding up everything from markers to iPhones. Will Sutton, well known for his wicked parkour skills, is quite possibly the only person capable of making selfie sticks cool. Using a GoPro and a selfie stick, the London-based professional free runner, created this action-filled point-of-view “selfie” video while showing off what he can do. Have a seat before watching this; Sutton’s incredible talent could make you dizzy.